Razer™, a world leader in connected devices and software for gamers, today announced the improved Razer Kraken Pro gaming headset. The Razer Kraken Pro now comes with inline controls for volume and mic mute in addition to its fully retractable microphone. Available in green, black and white, the Razer Kraken Pro is designed for ultimate comfort, delivering an unmatched balance of weight, functionality and performance. A closed ear cup with plush circumaural padding creates superior sound isolation, ensuring an immersive gaming experience over long periods of time, perfect for practice and tournaments. 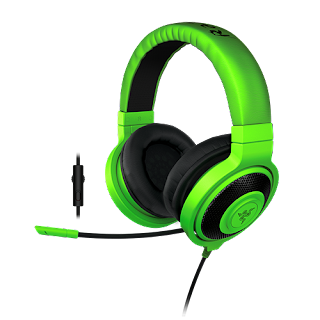 The Razer Kraken Pro headlines the Kraken family of audio devices, which also includes a USB-powered Razer Kraken 7.1 Chroma with 16.8 million customizable color options, and an audio solution for the Xbox One. For more information about the Razer Kraken Pro, please visit http://www.razerzone.com/gaming-audio/razer-kraken-pro.